Woodcut is a traditional garter stitch hap shawl: the centre triangle is knitted and cast off, then stitches are picked up for the lace section with an applied border finishing off the shawl. 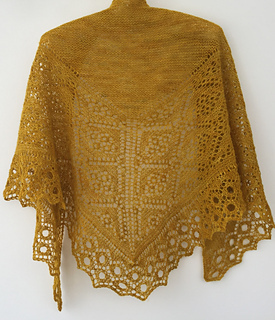 The shawl uses a delicate and exquisite lace yarn from Blacker Yarns, St Kilda. This yarn is a unique and rare homage to the Scottish archipelago and World Heritage site on the outer edges of the Hebrides. The pattern is fully charted with some written instructions. It includes a schematic and tips on how to modify the size. The Woodcut shawl is inspired by early modern woodcuts and how we understand lace charts. The yarn was chosen with care to reflect the importance of the materials we use in our projects.